While the National Marine Fisheries Service has declared an Unusual Mortality Event (UME) in the Northern Gulf of Mexico, it’s more than just oil spills that are causing increased strandings worldwide. 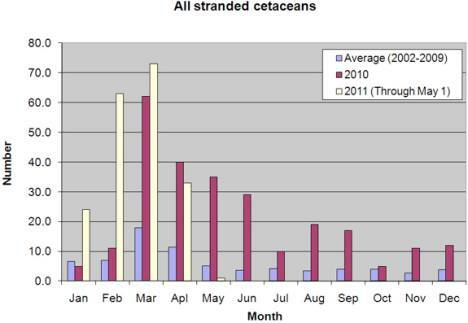 The occurences of beachings has increased. It could be any number of things at this point from nutrition to sonar throwing them off their intended path. The BP oil spill is a possible cause but might not be the only one. Speculations continue. It is still very uncertain as to why this is happening in different parts of the world.